Problem:- C Program for Shortest Job First (SJF) Scheduling Algorithm or C/C++ Program for shortest job first scheduling algorithm or Program for Shortest Job First (or SJF) scheduling or C++ Programming Codes and Concepts: Shortest Job First (SJF) or Write A Program In C++ For Shortest Job First or C program for shortest job first scheduling algorithm or C++ Program for Shortest Job First (SJF) Scheduling Algorithm. Explanation:- Shortest Job First (SJF) is a Non- primitive Scheduling Algorithm we also know SJF as Shortest Job Next (SJN). Shortest Job First (SJF) is also a pre-emptive scheduling algorithm, that means It is compulsory for CPU to know the next process how much time process will take for executing. In simple word, we can say that Shortest Job First (SJF) is executed (put on CPU priority) the only process those have a minimum time for execution. 1. What is Shortest Job First (SJF) Scheduling Algorithm?. What is Shortest Job First (SJF) Scheduling Algorithm?. 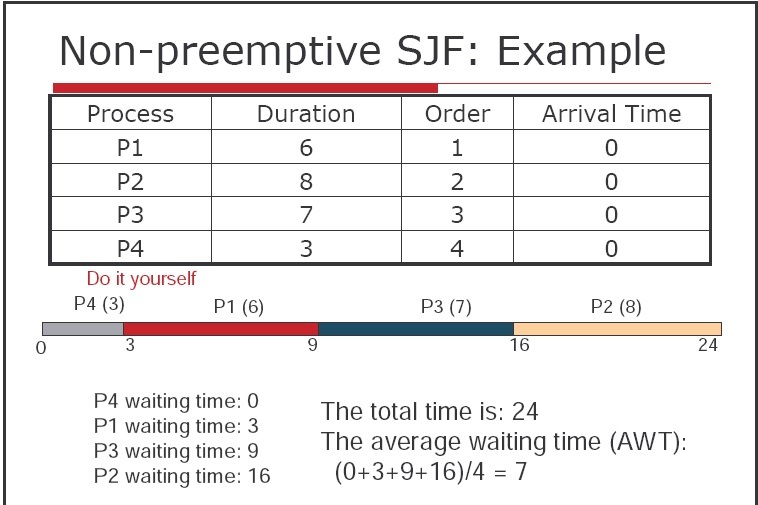 Shortest Job First (SJF) is a pre-emptive Scheduling Algorithm for execution Process in Minimum time order means, a process has a minimum time for execution execute first and then second minimum time taking process. SJF is an alternative for FCFS cause it reduces the average waiting time and also good for Batch systems. Example:- We are taking 4 process whose CBT, or Burst Time Is 6, 8, 7, 3 respectively and the output is given below. may i ask whats all the pointers for?